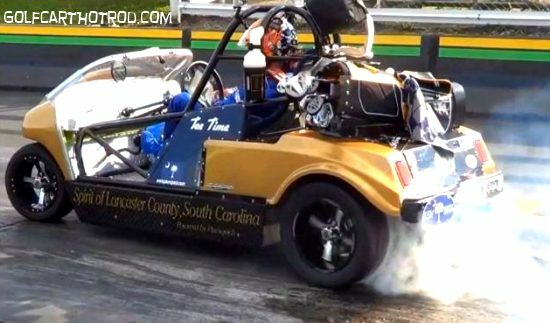 Video of the fastest 1/4 mile run of a true electric golf cart. This cart is road legal in the state of South Carolina and was once used on a local golf course for round play. The record setting run of 110.14 mph in the 1/4 mile was filmed at the Darlington Dragway in Hartsville, SC. Driver Robby Steen piloted the modified 2003 Club Car DS in it’s multipul record time runs to get recognized by the Guinness World Records.